After last night’s dinner (I had the Fatty Burger), I slept like a rock. Except for waking up with s cramp in my swollen left calf that nearly sent me through the ceiling of my tent. Dang that hurt. Oh and there were the three other times that the compression sock on that leg caused my Morton’s neuroma to flare up. This feels like a nail is being shoved into your foot. Nine hours of semi-restful sleep later I awoke to bid farewell to Peter and Gregg as they headed east. An hour later I was heading west after a healthy breakfast of two pop tarts. I had 45 miles to go until the next store st Bismarck so what could go wrong. I munched in Gardettos snack mix from time to time as I negotiated the curving rolling hills. More and more crops are giving way to cattle ranches. I looked forward to Twin Buttes that was indicated on my map. They weren’t twins (one was bald, the other covered in vegetation). And there was McMansion in between them. Location, location, location. The picture makes it look like Uluru but it’s not a tenth they size. My destination for the morning was the trauma center at Sanford Hospital in Bismarck. Before going in I stopped st s sun sandwich shop for second breakfast. I was handed s scratch off card and won a second sandwich. I walked into the ER and there was no line. After getting a room a nurse told me that the place filled just after I came in. I was given a Doppler ultrasound on both legs. The doctor poked and squeezed my calf trying to find some area of sensitivity. Nothing. The ultrasound showed no DVT. The doctor told me to wear a compression sleeve on my calf and sent me on my way. I decided to press on to New Salem for the sole reason that it was only 23 miles away. A nurse said the area was part of the Badlands but I looked it up. This area is topographically similar but much too green. One massive cattle ranch after the next. To get there I crossed the Missouri River. Woot! The ride featured significant climbing but I kept at it and arrived in New Salem at 6:30. Once in my tent I realized that I intended to ride only as far as Mandan which is across the river from Bismarck. When I left camp this morning I expected to lose a day to my schedule. Instead I gained about a third of a day. Martin woke me at 6. I suppose it was only fair since I woke him after midnight. He headed out before I got out of bed. I lingered to recharge my electronics. Then hit the road. There was no breakfast to be found in Gackle so I rode 12 miles, including 5 miles off route, to Streeter. They had no cafe and only a poorly stocked market. I bought two apples and a chocolate chip cookie ice cream sandwich. Bike touring diets are strange, what can I say? The road was actually quite hilly in sections, not exactly what my dead legs needed. In one marshy area the bird life was going nuts. I slowed to listen to their little symphony. It seems like every day I see a new animal. Today was pelicans. I rode by many herds of cattle. If you call out to them and say “Let’s go!” they’ll start running along side you. One herd got rambunctious and practically stampeded. Layer in the day I had horses galloping with me. They must have recognized The Mule. And there were crops. So many. Most fields around here have rocks in them. Some farmers make stacks of rocks. This farm had just cut its hay (I think). The uphills finally ended and I was given the benefit of a few miles of downhill. At Hazelton, I grabbed a campsite next to Peter (from Maine) and Gregg (from Boise, Idaho). They met on the road and seem to be well matched by the bike tour gods. We all went out for dinner and ate way too much. Medical note: My left calf ballooned today. It doesn’t hurt and I am breathing normally but it does not look good. Bismarck is about 40 miles away. If it looks like this tomorrow, I think I’ll swing by an ER. My schedule for a winter retirement day is pretty simple. In no particular order: eat breakfast, read the paper, ride my bike (or go for a hike), do either physical therapy (a.k.a. yoga) or go to the gym to lift weights, read a book or magazine, meditate, and do one adult thing. So today I began with a half mile walk to the hospital where I had a CT scan on my lungs and an echocardiogram. I’ll count these as one adult thing. After an administrative snafu I got signed in and escorted to the CT scan room. There I was passed under the machine once. Then I was injected with a dye and passed through again as the dye sent eerie warmth through my chest and head. (I really should do this stoned at least once.) Done. It only took five minutes. The CT tech took me to ultrasound where I was given my echocardiogram. I was positioned on my left side allowing me to watch the screen as the exam took place. The tech told me my blood pressure which was well within the normal range (as usual). She also told me my resting heart rate was 45. This is the first time since my DVT/pulmonary embolism crisis that it has been below 65. To me this is great news because my pulse is normally in the 40s. As I watched I could see the line for my heart going boing…thud……..boing…thud and so on. At one point there was audio. My heart sounds pretty cool. DOO…duh…..DOO…duh. I am pretty sure that my former co-worker Kelly would confirm that this is the only part of my body that has good rhythm. The tech cheated a bit and told me that my heart looked and functioned normally during my December echocardiogram. She was not surprised that it still did. That’s one organ less to worry about as far as I am concerned. I walked home in a cold wind and ate breakfast and read the paper. There was ample coverage of the Super Bowl which I thought was great even though my team lost. We can now move on to the winter Olympics and make a smooth seque into Spring Training. Yes, yes, yesyesyes. 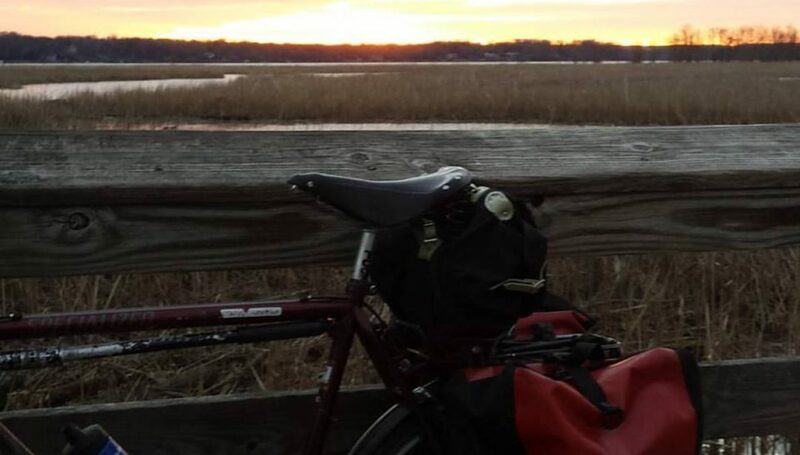 After my repast, I headed back out into the cold wind for a bike ride. I had on my normal winter bike commuting stuff: skating cap, heavy-weight neck gaiter, base layer, holey sweater, rain pants, and neoprene overboots. I was comfortable within a mile. I headed south past Mount Vernon and Fort Belvoir. I used the bike lane on US 1, a busy four-lane highway. I wanted to see how my mirror would work. It did fine. There were literally no surprises in that I saw every car, truck, and bus well before it was close to me. I turned north on Telegraph Road, the kind of totally inane roadway that Fairfax County is known for. Lanes come and go seemingly without rhyme or reason. Bike lanes also come and go. I came flying down a hill at 35 miles per hour in a bike lane. It was a good thing I came to a red light because 100 yards beyond the light, the bike lane disappeared. I rode all the way to the Beltway, took a right to go east on Huntington Avenue, and headed south on Fort Hunt Road where I stopped after 25 miles to go to the gym. For some reason my left arm is unhappy. It shoots sharp pains whenever I lift a weight above my head or push one away from me. Even though I use very light weight on two machines that move in this manner, my arm still hurts. I’ll bring this up with my doctor during my physical later this week. Finally, I rode 4 miles home into the cold wind. It was nearing 4 p.m. but the sun was still well above the horizon. We are now getting about the same amount of daylight as in early November. Works for me. All that’s left is some filing of medical stuff including beaucoup CDs and DVDs of my scans. Then I can read and eat dinner and call it a successful retirement day. And one more thing. My wife told me about this really cool National Geographic travel package. It takes you all around the world to Machu Pichu and the Holy Land and Burma and Paris and everywhere in between. On a private jet. Just $99,000 per person.